Crowne Plaza Five Lakes is a countryside hotel near Colchester and Maldon with 2 golf courses, a nightclub and a fitness centre. 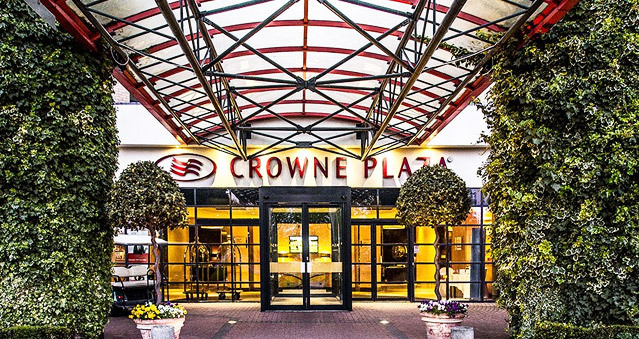 Crowne Plaza Resort Colchester, Five Lakes hotel gives guests ultimate comfort. Guests are lodged amid 320 acres of lush greenery, with golf courses, tennis and squash courts and lakes. The hotel offers complimentary WiFi and has 15 smart meeting rooms for business or events and teambuilding activities. Crowne Plaza Five Lakes has a capacity for 2,500 people and a car park with 550 spaces for attendees, plus overflow available on request. Perfect venue for any teambuilding event – The Killing, Around the World, Awakening the Dead, Stocks in the City, Mixology, The Ultimate Team Build, Get in the Zone and lots more to choose from. You can clock a few laps in the indoor pool, work up an appetite in the fitness centre, tennis courts or spa, then savour a delectable meal at the Brasserie or Grill Room or enjoy a light meal or relax with an evening drink in one of the 2 bars. Later, hit the dancefloor in the nightclub, open Fridays and Saturdays from February to November. Location: less than half an hour’s drive from Colchester and the A12; Witham and Colchester train stations are both 20 minutes’ drive away.